Companies operating in the global hysteroscopes market are banking upon collaborations and co-development agreements to improve their positions. In response to the surging demand for minimally invasive techniques, they are coming up with HD optical lenses with increased resolution that are built from special sapphire glass for proper visualization. They are also seen launching hysteroscopes with semi-flexible shaft at lower cost to up sales. Some of the prominent global participants in the global hysteroscopes market are MEDTRONIC, Olympus Corporation, Stryker, B. Braun Melsungen AG, and MedGyn Products, Inc. There are also many companies that have considerable presence in regional markets. Some of them are Richard Wolf Group, WISAP Medical Technology GmbH, LocaMed Limited, KARL STORZ GmbH & Co. KG, Maxer Medizintechnik GmbH, COMEG Medical Technologies (SOPRO-COMEG GmbH), and Optomic. 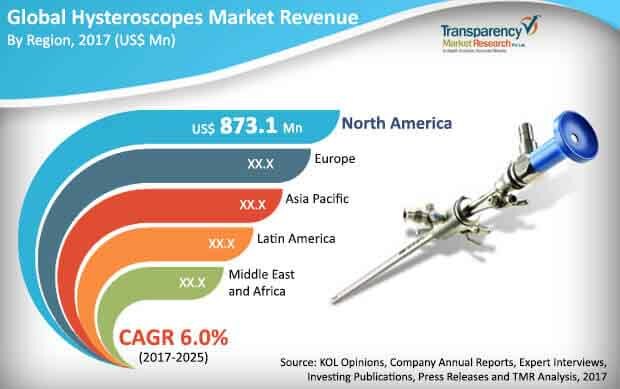 A report by Transparency Market Research predicts the global hysteroscopes market to rise at a CAGR of 6.0% during the period between 2017 and 2025 to become worth US$3.55 bn by 2025-end. The two main types of application segments in the global hysteroscopes market are diagnostic hysteroscopy and surgical hysteroscopy. The key geographical segments of the hysteroscopes market are Latin America, North America, Europe, Asia Pacific, and the Middle East and Africa. Of them, North America holds a dominant share in the market on the back of its state-of-the-art healthcare facilities available to the general public at affordable prices and substantial thrust on creating awareness about women’s health. The market in the region is expected to hold on to its dominant share going forward by registering a CAGR of 6.1% during the forecast period. Hysteroscopes are minimally invasive gynecological procedures that help to diagnose the intrauterine infections and are also used for surgical interventions. They have become immensely popular due to their accuracy, convenience, and low cost. They primarily serve to treat dysfunctional bleeding, painful fibroids, and other women-centric health issues. “Hysteroscopy can be carried out in shorter time using a local anesthetic. At present, it is considered as a gold standard treatment for uterine intracavitary diseases. The thrust on designing more effective products with differentiated functionalities and features are projected to bolster growth in the global hysteroscopes market,” adds the lead analyst of the TMR report. Both physicians and patients prefer hysteroscopy over traditional surgeries because of the excellent image brightness, ease of use, and greater stability they accord. Incisions are hardly required during the procedure and hence there is reduced post-operative discomfort. Such benefits have resulted in increasing adoption of hysteroscopes by gynecologists. Hysteroscopes serve to reduce hospital stay by bringing about faster recovery, which in turn is due to the lowered blood loss and blood transfusion risks and lowered surgical site infections due to limited incisions. Growing knowledge about such advantages is stoking their popularity in market. One challenge of the procedure is the complications regarding the proper entry of the device during surgical interventions. This, to an extent, is hampering demand, states the TMR report.